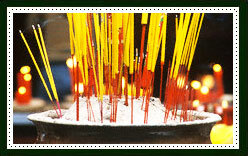 The advent of incense in Japan is often credited to the Buddhist monks, who came from China during the 6th century. The popularity of incense use began to rise gradually, as the Japanese people, esp the nobles, began to accept this new religion. Although incense came quite late, the Japanese soon turned the use of incense into a fine art. Special schools, called Kohdoh, were introduced which helped students learn the art of incense making, appreciate the fragrance and even learn the dances performed during incense burning rituals. They basically emphasized on using incense within a structure of codified conduct. It can take many, many years to master Kohdoh, sometimes even fifteen years or more. Initially, both incense material and recipes were exclusively imported from China but it was not long before they mastered the art of incense making and began indigenous manufacturing. The recipes mainly incorporated agarwood and sandalwood, imported from India, along with local herbs and spices. Initially, the use of incense was limited only to the elite class but with the formulation of senko sticks every one was affording the luxury of its aromatic smoke. One of the most popular incense material in Japan is Kyara. Kyara is the best available quality of aloes wood and is found in four qualities : Green, Iron, Purple and Black. It is called "jinkō" in Japanese which means "incense that sinks in water," due to the weight of the resin in the wood. Incense in Japan is widely used for meditation and religious purposes. The Buddhist monks extensively employs the enchanting fragrance as an aid to stimulate their mood and increase concentration while meditating and chanting. They believed that the fragrant smoke cleanses the air and the environment along with the the soothing effect on the psyche. They also used incense to honor their ancestors and forefathers. The Japanese, just like the Chinese, also used incense sticks to measure time. These incense clocks changed their aroma after specific span of time. Some more sophisticated ones dropped a metal bell which acted as alarms. The use of these incense timekeeping devices are believed to have spread from the Buddhist monasteries into mundane society. It was also used by the Geishas, the cost of their services being calculated from the number of sticks burnt. We manufacturer, supply, export all types of Japanese incense, japanese incense sticks, japanese incense cones, japanese dhoop sticks and other japanese incense products. Contact us to buy or for more information on any types of japanese incense.